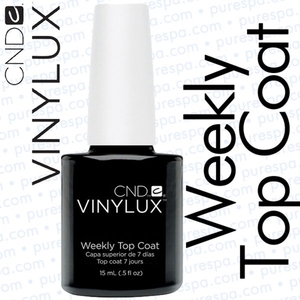 NOTE: Vinylux Top Coat must be used with Vinylux Colors to ensure proper application! CND Vinylux - Boheme / 0.5 oz. - 7 Day Air Dry Nail Polish. CND VINYLUX Weekly Polish System is a breakthrough that endures a week of fashion perfection… without a base coat. Exposure to natural light secures the patent-pending technology, creating an enduring, long-lasting polish. The new formula with advanced micropores allows for breathable coating strengthened by an infusion of 3 new caring ingredients to give you all the care your nails need. CND VINYLUX Weekly Polish Self-adhering color coat that delivers superior adhesion and eliminates the need of a base coat. Pure Spa sells to licensed professionals ONLY. Due to the chemical nature of this product, it must ship via UPS Ground only.